home Hardware Should You Buy A Keyboard Protector For Your MacBook? What exactly are they for? The main reason people buy keyboard protectors for their laptops is to protect the computer from spilled drinks and food. In the case of MacBooks the keyboard is pretty much the only place on the top of the computer where liquid can get inside the machine and into the internal components, as well as being the main place where food can get stuck – once food or dirt gets into the gaps between and under the keys, getting it out can be a challenge. 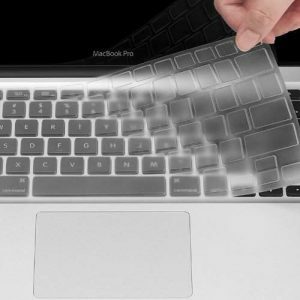 A keyboard protector would therefore be a good investment if you frequently eat and drink over your Mac, work in a dirty environment, are a clumsy person or if young children use the computer. It will ensure that your MacBook’s keyboard stays spotless and that nothing gets inside the machine that could cause damage to components. When the protector gets dirty all you need to do is take it off and clean it under a tap – since keyboard protectors are generally made out of rubber, you can clean them using water and then hang them out on the line to dry… Unlike your Mac’s keyboard! Which Kind Do I Buy? The main downside to keyboard protectors is that the soft rubber isn’t good in terms of tactile feedback. By itself the MacBook keyboard is crisp and responsive, however with a keyboard protector covering it the keyboard responds more sluggishly to keystrokes, which can lead to mistakes and an overall poorer typing experience. 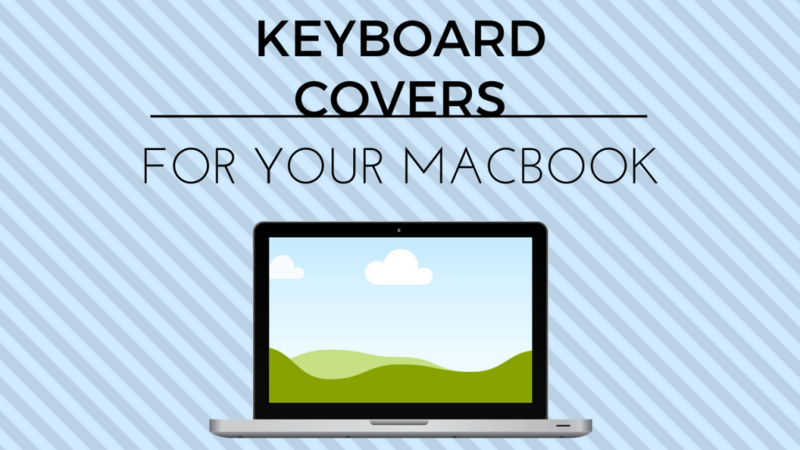 It is therefore important to buy a quality keyboard protector – one that is tight and fits your MacBook well (doing so will minimize the problem). Depending on your personal preferences, you might also find a keyboard protector unsightly. However you also might find it to be an attractive accessory, as they come in a range of colors and styles, from transparent to blue to pink to rainbow. One common concern people having about keyboard protectors is that the raised rubber will leave marks on their MacBook’s screen when the lid is closed. Many keyboard protectors don’t sit high enough to reach the screen, and for those that do it’s still not really an issue, as any marks that it leaves on the screen can simply be wiped off like any other smudge. Another thing people worry about when it comes to keyboard protectors is ventilation – many people think that MacBooks vent heat via the keyboard (through gaps under the keys), and thus that using a keyboard protector will interfere with the flow of air and cause the computer to overheat. Fortunately though MacBooks do not vent or intake air via the keyboard – no model ever has, and it is very doubtful that Apple will make one that will. So where do MacBooks have vents? In the hinge, with the exception of the Retina MacBook Pro, which also has vents on the sides (if your Mac is overheating or you wish to know more about this, click here). Therefore you are safe to use a keyboard protector with any model of MacBook.